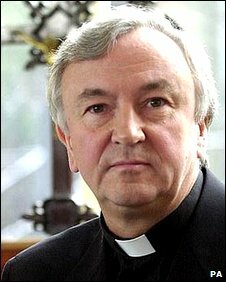 Archbishop Nichols has maintained a high profile in the Church. Many young people are drawn into gangs in an attempt to bolster their weakened identity, the leader of Roman Catholics in England and Wales will warn later. The Most Rev Vincent Nichols will speak in his first Christmas Midnight Mass as Archbishop of Westminster, of people's longing for a sense of community. He says a visit to a young offenders' institution reminded him of "so many" young people who resorted to gangs. He will say happiness comes from family and community, not status and fame. The Archbishop will speak of the "growth" that comes with the acceptance of God's love and forgiveness and the "happiness of forgiveness, serving others, shared joy and lasting love". "We know that our happiness lies much closer to home - in our steady relationships of friendship and love - in family and community," he will say in his sermon in Westminster Cathedral. He is expected to add that deceit and bitterness can be overcome by accepting God's love and forgiveness, which is part of the Christmas celebration of Jesus' birth. The Mass and Vigil, to be televised on BBC1 on Thursday evening, will include prayers for the people of Bethlehem and for British troops in Iraq and Afghanistan. The First Mass of Christmas from Westminster Cathedral will be broadcast on BBC1, beginning at 2345 GMT on Thursday.